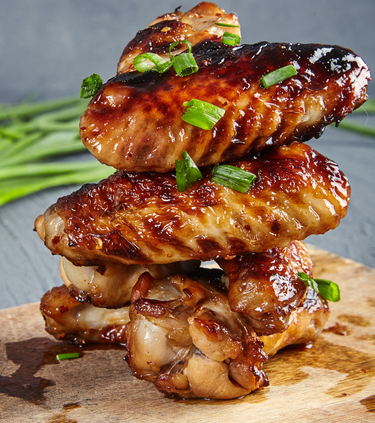 This recipe pays homage to Sabrina Ghayour's fabulous Orange, Thyme and Spice Sticky Chicken wings from her amazing Sirocco Cookbook, with just a few minor tweaks. Ideal as part of a buffet it also makes great finger food too - for those who love things sticky. Make well ahead, the day before at least, so the marinade can work its magic. 1Put the chicken wings or drumlets in a large bowl. 2Combine all the marinade ingredients in a large bowl, season well with salt and pepper, and mix together. Then add the chicken. Using a spoon to stir the marinade really well to help work into the chicken wings, then cover the bowl with clingfilm and refrigerate overnight. 3To cook, make sure the chicken is at room temperature. Preheat the oven to 200C and line a large baking tray with baking paper. 4Place the chicken smothered with marinade on the prepared tray. Set aside the excess marinade. Roast the chicken on the top shelf of the oven for 25 minutes. Turn over drizzle over some of the reserved marinade. Continue to roast until the chicken is deeply browned and cooked through. (The marinade will make them blacken a little around the edges, which is fine). 5Next, take the left over marinade to make a dipping sauce to serve on the side. Place the marinade in a small saucepan over a high heat and bring to boil. Cook only for a few minutes until it becomes thick, like a sauce. If it becomes too thick, add a tablespoon of water. Remove any twiggy bits of thyme now before pouring into a small sauce bowl then garnish with a sprinkle of spring onion or fresh coriander.